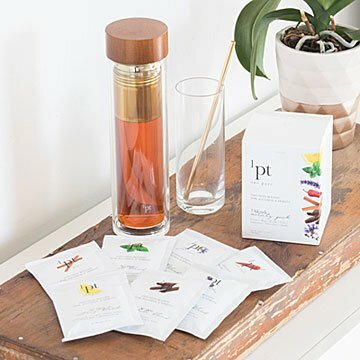 With this kit, even beginners can easily make top-notch craft cocktails at home, using custom infusions. Infuse at lunchtime, and have cocktails ready for dinner. The flavor blends included in this kitcinnamon, citrus, chili, chocolate, floral, mint, and smokymake at-home craft cocktail mixology simple and swift. Add your booze of choice to the contents, and in a few hours, use your homemade elixir to mix the best cocktails you've ever made. Just one tantalizing example: Make a spicy margarita really zing by infusing your favorite tequila with the chili blend. Each of the six balanced flavors infuses a half bottle of liquor, complementing, rather than conquering it. The kit contains suggested liquor pairings, a 16-oz. infusion bottle, a super-fine steel filter that fits inside it, and a tasting straw to help you decide when the flavors are just right. Then, you're ready to create some next-level drinks for your next gathering. Blends made in US. Bottle made in China. Infusion Bottle includes one 16 fl. oz. glass bottle, cocktail recipes, and tasting straw. Infusion Blend Sampler Pack includes seven infusion blends: cinnamon, citrus, chili, chocolate, floral, mint, and smoky. I bartend and I've been looking for some ways to spice up my cocktails and this was PERFECT. Super easy to use and the packets are amazing! !